Russian band ARKONA dates back to 2002, when two local bands joined forces, or parts of the bands, and HYPERBOREA was born. Most of the members are not still in ARKONA, but vocalist Marsha “Scream” remains. The others are Sergej Lazar, guitars, Ruslan “Kniaz”, bass, and Vlad “Artist” on drums. The last few years have been good to the band, earning them a place among the best in the Pagan genre. The EP teaser “Stenka Na Stenku” promised good for this album too, is it all that good? The frequent use of intros may not be according to the success formula of the previous EP, it´s something that strikes me after a few spins. To me it´s mostly a loss of pace, something that is not to the advantage of the band. ARKONA should be about mixed instruments, both metal and folk, Russian melodies and epic numbers, as well as ferocious but shorter refrain based attempts at hits. To me the ultimate efforts on this album are the hit-like “Stenka na Stenku” and the epic, almost DIO-like “Zimushka”. It is definitely not the odd and accordion based “Leshiy”. The vocals are obnoxious compared to the rest of the album and the odd arrangements are an absolute excuse for reaching for the fast forward button. 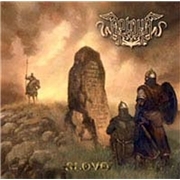 Most of the time ARKONA play folk with amusing mixes of instruments and a heavy emphasis on Russian melodies. Sometimes they opt for more black metal orientated features like guitars on acid and growls as in “Nikogda”. I think ARKONA has the road ahead paved, if they stick to their guns and rely on their strengths. This is not a short album and the basic ideas are mostly good. Stick to those and fame and fortune awaits. But for now they mix it up too much at times, leaving me wanting more in the vein of my favorite tracks.